LAS VEGAS – Oct. 7, 2013 – Today at the 2013 International Baking Industry Exposition (IBIE®) , Cargill announced the attributes that resonate most with parents as they consider buying bakery items. The proprietary Cargill Gatekeeper Purchase Drivers Study of more than 1,000 consumers explored parents’ attitudes and drivers of food and beverage purchases for their children. 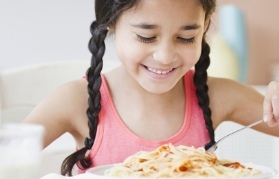 This research was conducted as part of Cargill’s childhood nutrition initiative, a new effort which aims to help food and beverage makers and foodservice operators formulate products that improve the nutrition profile of products targeted to children. The study found that most parents try to keep meals healthy, but still allow for treats (59%). Younger parents are more likely to say this than older parents with 66% of Millennials (ages 18 to 32 years) versus 53% of Generation X parents (ages 33 to 47 years). This suggests that, as more young consumers become parents, a balanced approach may become even more prevalent. And, moms are actually more likely than dads to be striving for a balance of healthier and less healthy foods and beverages in their children’s diets (51% of moms versus 42% of dads). The Cargill study looked across nine categories heavily consumed by children, including four key bakery categories—cookies, bread/rolls, crackers and snack bars— to determine the attributes that resonate with parents. In general, parents showed a relatively low level of satisfaction with the healthfulness of the products currently on the market, and they indicated they’re looking for healthier options. Only two in 10 say they’re satisfied and not really looking for healthier choices but nine in 10 parents say they’d be likely to purchase healthier versions of foods. In the survey results, a wide gap between parent satisfaction and intent to purchase a healthier version suggests an opportunity for bakers to innovate with better-for-you products in four baking categories (cookies, breads/rolls, crackers and snack bars). The biggest opportunity was on cookies, which showed an opportunity gap of 24 points. The survey also revealed an opportunity for making healthier versions of breads/rolls (9 point gap), crackers (8 point gap) and bars (8 point gap). When looking to determine parents’ purchase drivers for healthier bakery products, three factors resulted -- “seeking,” “avoiding,” and having a “clean” label. “Seeking” is about desiring products with positive nutrition, including nutrient density, inherent benefits, and foods that contain nutrients that are also found in fruits and vegetables. It’s also about products that provide “good” things such as whole grains, and fiber. “Seeking” was a key driver of purchase for all four bakery categories researched. “Avoiding” is about reducing the attributes consumers perceive to be not as good for you, such as fat, sodium, calories or sugar in products. When it comes to baked goods, “avoiding” was not a strong purchase driver. Having a “clean” label is largely about including ingredients that are clearly recognized by consumers—rather than containing chemical-sounding ingredients. “Clean” label was a strong purchase driver for cookies, bread/rolls and crackers. “Our research suggests there is an opportunity to innovate in the bakery space through the creation of healthier, great tasting treats and snacks for children. Cargill believes we all have a stake in improving kids’ nutrition – families, government, public health organizations and the food industry. We have focused resources to help customers develop bakery formulations with more nutrient density. We can help add more whole grains, fiber and protein and/or help limit things like trans fat, sat fat, sugar and sodium. The Cargill Gatekeeper Purchase Drivers Study has helped us identify what parents want, and we’re working closely with our customers to deliver,” added Roullier. This survey was conducted by Cargill’s marketing research group to determine the key attributes that resonate most with parents across nine food and beverage categories that are popular with children: cereal, cookies, crackers, bread/rolls, snack bars, fruit juice/drinks, frozen pizza, ice cream and carbonated soft drinks . It was an online survey of more than 1,000 people fielded in November 2012. The sample consisted of a mix of general population consumers and parents of children ages 2 to 12 so that responses of parents could be compared to those of non-parents / general population. More than two-thirds of the respondents were parents. Parents were asked about food and beverage purchases for their child(ren), while the general population was asked about purchases for their household.